For my collage, I started with two of my own photos that I took of the Seattle skyline. I happened to have these pictures of the city, both during the day and night, taken from the same location. Every other image, except for the fireworks and skylines, that I used in my project was found on google images or pexels.com. Some images, like the sunset and stars, I chose to emphasize the difference between day and night. 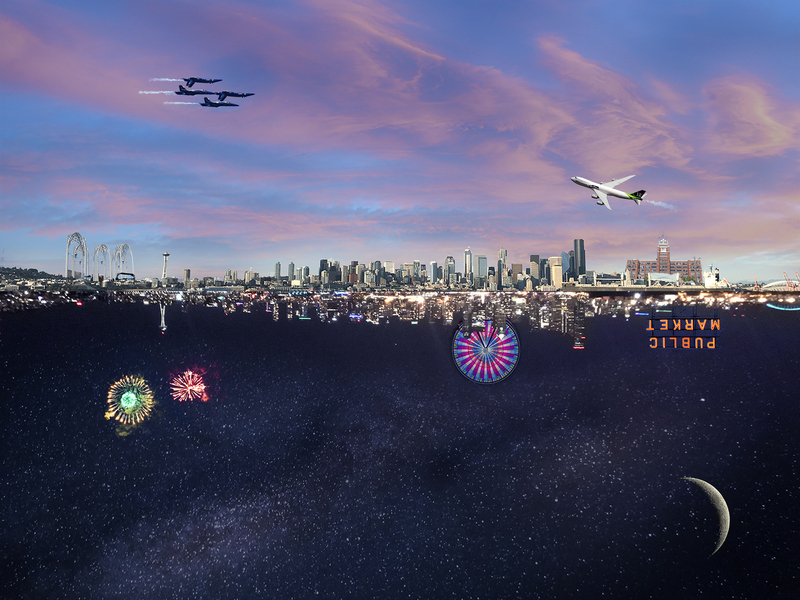 All of the smaller images placed in the collage were chosen to represent the city of Seattle and display what popular features it has to offer. The one principle of design that I focused on the most was contrast. I wanted the colors and values on each half of my collage to be dramatically different. For example, on the ‘day time’ side I chose lighter and softer colors, whereas on the ‘night time’ side I used darker, brighter, and more intense colors. I also wanted to incorporate a sense of balance in my collage, so I tried to place an even number of images on each side. There are many elements of design used as well, such as the lines, shape, and direction of the city skylines. The size of each image was specifically chosen to ensure my project looked balanced. I wanted the skylines to be the main focus so that my viewers eyes would see that first then look around at the images on either side. When viewers look at my project I would hope that they see I am trying to show how Seattle has fun things to do during any time of the day. In addition, I wanted to display the fact that Seattle is constantly busy and there is always a lot going on. Since I live there, this collage is very meaningful to me and I hope that others can see that as well. I chose to add images that exhibit the places I’ve visited or experiences I have had. This includes visiting the Pacific Science Center, the Great Wheel, and Pike Place Market. I also have seen the Blue Angels during Seafair, New Year’s fireworks at the Space Needle, and visited Starbucks headquarters. I placed a Boeing jet painted with the ‘12thman’ Seahawks logo in my collage to represent Boeing as a company and the Seahawks. There are many companies and landmarks that symbolize the city of Seattle and I really wanted to demonstrate that through my project. Some of the tools in Photoshop I used the most frequently were the quick selection tool along with Select > Color Range. These two functions helped me to crop each of the images that I placed in my collage. I also adjusted the Color Balance, Hue/Saturation, Curves, and opacity of my images to make them look somewhat realistic. I believe that this collage needed to be constructed digitally and that it would be nearly impossible to recreate it with another method. I was influenced by photography and the photos that I have taken on my own. When I saw the pictures, I took of Seattle I decided to add images to represent everything that I love about my city.